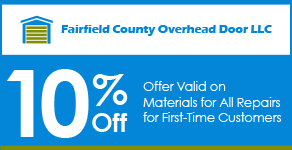 Save time and money with the all-in-one sale and installation of Fairfield County Overhead Door LLC. From garage door cables and springs to electronic openers, we have got them all for you. Upgrade your home's garage easily with our hassle-free overhead garage door repair and replacement service. Call us today for an initial consultation, and we will go to your place right away. Fairfield County Overhead Door LLC in Stamford, Connecticut, specializes in garage door installation and garage door repair. Operating as a local business for more than 30 years, we deal with you personally and take care of your needs in a timely and professional manner. Contact us in Stamford, Connecticut, for top-notch garage door installation and repair services.